Psalm 119:25 DALETH “My soul is laid low in the dust. Revive me according to Your word! 26 I declared/recounted my ways, and You answered me. Teach me Your statutes. 27 Let me understand the teaching of Your precepts! Then I will meditate on Your wondrous works. 28 My soul is weary with sorrow: strengthen me according to Your word. 29 Keep me from the way of deceit. Grant me Your law graciously! 30 I have chosen the way of truth. I have set Your ordinances before me. 31 I cling to Your statutes, Yahweh. Don’t let me be disappointed. 32 I run in the path of Your commandments, for You have set my heart free." 119:28-29 The soul weighed down with sorrow seeks strength from God's word. See “Can God Meet Emotional Needs” for how this works if you don't regularly experience it. Hint, it's frequently a matter of having God's perspective and grace rather than having our vision clouded by Satan's deception. 119:30-32 The psalmist chooses to follow God's way, and sets His ordinances in front of himself. He clings to the promises offered in God's word with the faith that God will fulfill them and he won't be disappointed. Then after all of the above, he is able to run, not walk in the paths of God's word, for He has set his heart free from the problems that weighed him down. Application: Get God's perspective on problems to get freedom from sorrow. Prayer: God, help me see the events of my life from the perspective of Your word and purposes; set me free from anything that will hinder my obedience to You. Thanks. Amen. Observations: 27:7 A little deprivation is not a bad thing; it makes us appreciate the good when we get it. 27:8 Wandering hearts lead to wandering feet. Most don't intentionally decide to dive into sin. 27:9 Wise people value and appreciate counsel from people who have their best interest at heart. Don't shoot the messenger if you don't like the counsel. “Earnest counsel” usually tells us what we don't want to hear, to keep us from wandering away into destruction. Application: Listen to advice and accept instruction from those who know you, or you will loathe your stupidity when you reap the consequences of your wandering. Prayer: God, thanks for friends who want my best; may I hear Your voice through them. Amen. Matthew 14-17 After being rejected by the religious leaders and presenting “hidden” information about the kingdom in the chapter 13 parables, Jesus withdraws from announcing the kingdom to focus on training the twelve. He miraculously meets the needs of the multitudes and His disciples, displays His glory on the Mount of Transfiguration, and in the mouth of a fish. He talks of building His church, and gives Peter the keys to the kingdom (whatever that means). There are a few thorny theological issues in chapter 16, which you might not grasp the first time through. 14:1 At that time, Herod the tetrarch heard the report concerning Jesus, 2 and said to his servants, "This is John the Baptizer. He is risen from the dead. That is why these powers work in him." 3 For Herod had laid hold of John, and bound him, and put him in prison for the sake of Herodias, his brother Philip’s wife. 4 For John said to him, "It is not lawful for you to have her." 5 When he would have put him to death, he feared the multitude, because they counted him as a prophet. 6 But when Herod’s birthday came, the daughter of Herodias danced among them and pleased Herod. 7 Whereupon he promised with an oath to give her whatever she should ask. 8 She, being prompted by her mother, said, "Give me here on a platter the head of John the Baptizer." 9 The king was grieved, but for the sake of his oaths, and of those who sat at the table with him, he commanded it to be given, 10 and he sent and beheaded John in the prison. 11 His head was brought on a platter, and given to the young lady: and she brought it to her mother. 12 His disciples came, and took the body, and buried it; and they went and told Jesus. 13 Now when Jesus heard this, he withdrew from there in a boat, to a deserted place apart. When the multitudes heard it, they followed him on foot from the cities. 14 Jesus went out, and he saw a great multitude. He had compassion on them, and healed their sick. 15 When evening had come, his disciples came to him, saying, "This place is deserted, and the hour is already late. Send the multitudes away, that they may go into the villages, and buy themselves food." 16 But Jesus said to them, "They don’t need to go away. You give them something to eat." 17 They told him, "We only have here five loaves and two fish." 18 He said, "Bring them here to me." 19 He commanded the multitudes to sit down on the grass; and he took the five loaves and the two fish, and looking up to heaven, he blessed, broke and gave the loaves to the disciples, and the disciples gave to the multitudes. 20 They all ate, and were filled. They took up twelve baskets full of that which remained left over from the broken pieces. 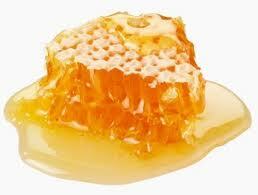 21 Those who ate were about five thousand men, besides women and children. 22 Immediately Jesus made the disciples get into the boat, and to go ahead of him to the other side, while he sent the multitudes away. 23 After he had sent the multitudes away, he went up into the mountain by himself to pray. When evening had come, he was there alone. 24 But the boat was now in the middle of the sea, distressed by the waves, for the wind was contrary. 25 In the fourth watch of the night, Jesus came to them, walking on the sea. 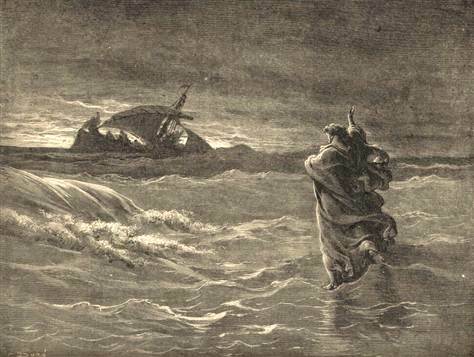 26 When the disciples saw him walking on the sea, they were troubled, saying, "It’s a ghost!" and they cried out for fear. 27 But immediately Jesus spoke to them, saying "Cheer up! It is I! Don’t be afraid." 28 Peter answered him and said, "Lord, if it is you, command me to come to you on the waters." 29 He said, "Come!" Peter stepped down from the boat, and walked on the waters to come to Jesus. 30 But when he saw that the wind was strong, he was afraid, and beginning to sink, he cried out, saying, "Lord, save me!" 31 Immediately Jesus stretched out his hand, took hold of him, and said to him, "You of little faith, why did you doubt?" 32 When they got up into the boat, the wind ceased. 33 Those who were in the boat came and worshiped him, saying, "You are truly the Son of God!" Observations: 14:1-12 Matthew begins to focus on lessons for the disciples. 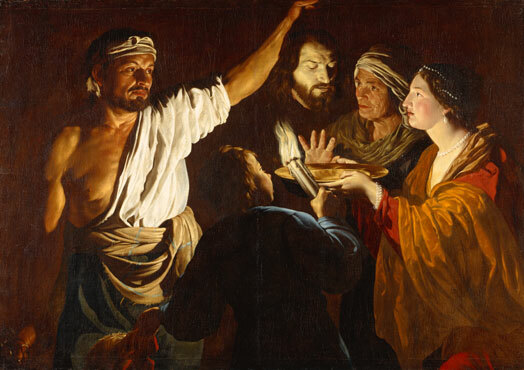 John the Baptist gets beheaded because of Herod's lust. When a ruler wants to gratify their desires rather than do God's will, and righteously care for His people, folks get hurt. 14:13 In contrast to Herod's concern for his passions, Jesus has compassion on the people's needs, even in His grief for the loss of John. This is the first of two miraculous feeding, book-ending a section teaching His disciples dependence upon God, especially in provision of physical needs. Jesus first highlights the need of the people and the disciple's inadequate resources. Next the disciples place what they have at Jesus' feet in response to His direction. Jesus looks to the Father, and gives to the disciples so they can give to others. Each disciple walks away with a doggie basket as a reminder that God satisfies needs abundantly. 14:22-33 Jesus sends the disciples and people away, and spends time alone with the Father in prayer. 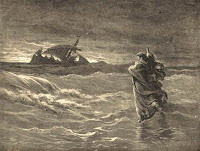 The disciples, some of whom were professional fishermen, encounter rough seas and are distressed. Jesus comes to be with them, walking upon the water. He demonstrates a mastery over the physical realm similar to that of the Spirit of God hovering over the waters in Genesis 1:2. Peter wants to verify that it is indeed the Lord, and asks Jesus to command him to come to Him; but Peter takes his eyes off Jesus' command and focuses on the problem, and falters. Jesus saves him in response to His request, rebukes him for his little faith, and stills the wind. The disciples confess that Jesus, the Son of Man, is the Son of God. They might have been convinced He was a prophet by the miracles, but this mastery of the elements goes beyond that to being convinced that He is the Messiah. 14:34-36 Jesus receives a positive reception among the people as those who come to Him are made whole. The religious establishment in the next chapter are a different story. Application: God meets the needs of those who come to Him, and comes to the aid of those who are seeking to do His will. Prayer: Lord, You are totally capable of giving me my daily bread, stilling my storms, and making me whole, may I honor You with my faith in You, and my focus on You. Amen. 15:1 Then Pharisees and scribes came to Jesus from Jerusalem, saying, 2 "Why do your disciples disobey the tradition of the elders? For they don’t wash their hands when they eat bread." 3 He answered them, "Why do you also disobey the commandment of God because of your tradition? 4 For God commanded, ‘Honor your father and your mother,’ and, ‘He who speaks evil of father or mother, let him be put to death.’ 5 But you say, ‘Whoever may tell his father or his mother, "Whatever help you might otherwise have gotten from me is a gift devoted to God," 6 he shall not honor his father or mother.’ You have made the commandment of God void because of your tradition. 7 You hypocrites! Well did Isaiah prophesy of you, saying, 8 ’These people draw near to me with their mouth, and honor me with their lips; but their heart is far from me. 9 And in vain do they worship me, teaching as doctrine rules made by men.’"
10 He summoned the multitude, and said to them, "Hear, and understand. 11 That which enters into the mouth doesn’t defile the man; but that which proceeds out of the mouth, this defiles the man." 12 Then the disciples came, and said to him, "Do you know that the Pharisees were offended, when they heard this saying?" 13 But he answered, "Every plant which my heavenly Father didn’t plant will be uprooted. 14 Leave them alone. They are blind guides of the blind. If the blind guide the blind, both will fall into a pit/ditch." 15 Peter answered him, "Explain the parable to us." 16 So Jesus said, "Do you also still not understand? 17 Don’t you understand that whatever goes into the mouth passes into the belly, and then out of the body? 18 But the things which proceed out of the mouth come out of the heart, and they defile the man. 19 For out of the heart come forth evil thoughts, murders, adulteries, sexual sins, thefts, false testimony, and slander. 20 These are the things which defile the man; but to eat with unwashed hands doesn’t defile the man." 21 Jesus went out from there, and withdrew into the region of Tyre and Sidon. 22 Behold, a Canaanite woman came out from those borders, and cried, saying, "Have mercy on me, Lord, you son of David! My daughter is severely demonized!" 23 But he answered her not a word. His disciples came and begged him, saying, "Send her away; for she cries after us." 24 But he answered, "I wasn’t sent to anyone but the lost sheep of the house of Israel." 25 But she came and worshiped him, saying, "Lord, help me." 26 But he answered, "It is not appropriate to take the children’s bread and throw it to the dogs." 27 But she said, "Yes, Lord, but even the dogs eat the crumbs which fall from their masters’ table." 28 Then Jesus answered her, "Woman, great is your faith! Be it done to you even as you desire." And her daughter was healed from that hour. 29 Jesus departed there, and came near to the sea of Galilee; and he went up into the mountain, and sat there. 30 Great multitudes came to him, having with them the lame, blind, mute, maimed, and many others, and they put them down at his feet. He healed them, 31 so that the multitude wondered when they saw the mute speaking, injured whole, lame walking, and blind seeing—and they glorified the God of Israel. 32 Jesus summoned his disciples and said, "I have compassion on the multitude, because they continue with me now three days and have nothing to eat. I don’t want to send them away fasting, or they might faint on the way." 33 The disciples said to him, "Where should we get so many loaves in a deserted place as to satisfy so great a multitude?" 34 Jesus said to them, "How many loaves do you have?" They said, "Seven, and a few small fish." 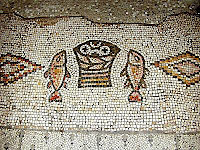 35 He commanded the multitude to sit down on the ground; 36 and he took the seven loaves and the fish. He gave thanks and broke them, and gave to the disciples, and the disciples to the multitudes. 37 They all ate, and were filled. They took up seven baskets full of the broken pieces that were left over. 38 Those who ate were four thousand men, besides women and children. 39 Then he sent away the multitudes, got into the boat, and came into the borders of Magdala. Observations: 15:1-9 The chapters open with the disciples sharing in the opposition to the Messiah as a delegation from Jerusalem travels 60 miles to complain that the disciples aren't washing their hands properly. Ah, the trials of tradition (rabbinic ritual, not Biblical command, although it was asserted as such). There were elaborate instructions about how to pour at least an eggshell's worth of water over each hand, three times, in different directions. Jesus counters with a question of why they disobey the clear command of God because of their tradition (one of the great hindrances to truth). The truth said to honor one's parents. The tradition said if some dedicated something to the temple (a vowed gift offering - “korban” Mk 7:11), then it was exempted from being used to help one's parents. Politely informing them that they were wicked hypocrites (cf Ps 50), Jesus then quotes Isaiah 29:13 to show that their oral tradition has made their “worship” worthless, because they are following tradition rather than truth. Worship is a response to God's revelation, not man's tradition. Most believers I meet follow the oral tradition of sermons rather than the written truth of God's word (because the bulk of their belief system is formed by the former, rather than informed by the latter). If someone can't demonstrate that their beliefs and actions are based upon an accurate contextual application of God's word, Jesus would call their worship worthless, and He might have another term for them. Truthless traditionalists were responsible for the death of Jesus, the apostles, most martyrs, and countless relationships with God. 15:10-20 Jesus calls the multitude to put the emphasis where God wants it, not on mere external rituals and practices, but on one's heart. Anything that goes into the body via the mouth, leaves the body. What goes into the heart, via the brain, comes out of the mouth, and can defile, rendering one unfit for worship and blessing. The disciples told Jesus the Pharisees were offended by His comments (as if He didn't know). He softened the critique by saying that the Father would uproot them as weeds (and burn them – implied) because they were blind guides, headed, along with their hearers, into a pit/ditch. In His list of things which arise from the heart (seat of values and decisions) and cause defilement in God's sight, He starts with evil thinking and murder, and ends with slander/blasphemy (speaking against someone) which is what the Pharisees were doing. So not only are they blind hypocrites headed for destruction, but defiled and excluded from the presence of God. Dusty hands don't defile a person, an unwashed heart does (see Rm 12:1-2 for a solution to any of the defiling acts mentioned, they all stem from an un-renewed mind/values). The lesson for the disciples is to major on truth, and avoid the defiled slanderers who embrace tradition at the expense of truth. 15:21-28 Moving west from the Sea of Galilee toward the Mediterranean Sea, toward a “divine appointment,” Jesus encounters a pained Canaanite parent whose daughter is demonized. Jesus ignores her at first, because His mission to the Gentiles comes after that to the Israelites. It is through the Jews that God will bless the world (in accord with the Abrahamic Covenant -Gen 12). The recognition that Jesus is the only solution to her problem causes her to persist in seeking help, and Jesus honors her faith. The lesson for disciples is maintain focus on the objective, but help the worthy. 15:29 Back toward Galilee, Jesus heads up the mountain (same one?? ), and heals all who come to Him. As a result of the good works which display God's power, people glorified God (cf. 5:17). Jesus expresses His compassion in another lesson for the disciples, following the same pattern of the first feeding of the multitudes, comprised of this time of mainly Gentiles (east coast of Galilee). This time seven loaves yield seven baskets of leftovers (instead of 12). Perhaps the symbolic significance of “seven” is intended (fulness or completion). When one encounters two “bookends” (similar passages), look for the similarities and differences, and then examine the material in between for any patterns or structure. The “lessons for the disciples” is one way of understanding the material, but doesn't exhaust it. Application: Biblical truth and oral tradition are frequently at odds with each other. The blessed trust the truth, the defiled trust tradition. Prayer: Lord, help me be diligent in learning and applying Your truth, so that I might not be defiled and excluded from Your blessing by the fables taught by blind guides. Amen. 16:1 The Pharisees and Sadducees came, and testing him, asked him to show them a sign from heaven. 2 But he answered them, "When it is evening, you say, ‘It will be fair weather, for the sky is red.’ 3 In the morning, ‘It will be foul weather today, for the sky is red and threatening.’ Hypocrites! You know how to discern the appearance of the sky, but you can’t discern the signs of the times! 4 An evil and adulterous generation seeks after a sign, and there will be no sign given to it, except the sign of the prophet Jonah." He left them, and departed. 5 The disciples came to the other side and had forgotten to take bread. 6 Jesus said to them, "Take heed and beware of the yeast of the Pharisees and Sadducees." 7 They reasoned among themselves, saying, "We brought no bread." 8 Jesus, perceiving it, said, "Why do you reason among yourselves, you of little faith, ‘because you have brought no bread?’ 9 Don’t you yet perceive, neither remember the five loaves for the five thousand, and how many baskets you took up? 10 Nor the seven loaves for the four thousand, and how many baskets you took up? 11 How is it that you don’t perceive that I didn’t speak to you concerning bread? But beware of the yeast of the Pharisees and Sadducees." 12 Then they understood that he didn’t tell them to beware of the yeast of bread, but of the teaching of the Pharisees and Sadducees. 13 Now when Jesus came into the parts of Caesarea Philippi, he asked his disciples, saying, "Who do men say that I, the Son of Man, am?" 14 They said, "Some say John the Baptizer, some, Elijah, and others, Jeremiah, or one of the prophets." 15 He said to them, "But who do you say that I am?" 16 Simon Peter answered, "You are the Christ, the Son of the living God." 17 Jesus answered him, "Blessed are you, Simon Bar Jonah, for flesh and blood has not revealed this to you, but my Father who is in heaven. 18 I also tell you that you are Peter (the pebbble), and on this rock (the bedrock) I will build my church, and the gates of Hades will not prevail against it. 19 I will give to you the keys of the Kingdom of Heaven, and whatever you bind on earth will have been bound in heaven; and whatever you release on earth will have been released in heaven." 20 Then he commanded the disciples that they should tell no one that he was Jesus the Christ. 21 From that time, Jesus began to show his disciples that he must go to Jerusalem and suffer many things from the elders, chief priests, and scribes, and be killed, and the third day be raised up. 22 Peter took him aside, and began to rebuke him, saying, "Far be it from you, Lord! This will never be done to you." 23 But he turned, and said to Peter, "Get behind me, Satan! You are a stumbling block/offense to me, for you are not setting your mind on the things of God, but on the things of men." 24 Then Jesus said to his disciples, "If anyone desires to come after me, let him deny himself, and take up his cross, and follow me. 25 For whoever desires to save his life/soul will lose it, and whoever will lose his life/soul for my sake will find it. 26 For what will it profit a man, if he gains the whole world, and forfeits his life/soul? Or what will a man give in exchange for his life/soul? 27 For the Son of Man will come in the glory of his Father with his angels, and then he will render to everyone according to his deeds. 28 Most certainly I tell you, there are some standing here who will in no way taste of death, until they see the Son of Man come/appear in his Kingdom." Bill Blurb: Sorry, the following belongs more in a book than a blog, but there are lots of misconceptions that have sprung from a misunderstanding of this chapter, which need pruning for fruitful thinking. Feel free to skip the first section, it's mainly historical background, skim the sections on Peter and the keys (unless you debate the topics), but don't miss getting a firm grip on the call to discipleship. Observations: 16:1-4 In contrast to the receptivity of the multitudes, the Pharisees again seek a sign (12:39), only this time in league with the Sadducees (their normal opponents who didn't believe in a resurrection or afterlife). Jesus adds the fact that they are hypocrites and stupid, to their being wicked and adulterous, and departs from them. 16:5-12 Jesus warns the disciples against the false teaching of the two popular parties. The Sadducees were more the political aristocrats of the two, and controlled the Sanhedrin and the Temple. They accepted only the five books of Moses, denied angels, demons, God's involvement in everyday affairs, and of course the resurrection and reward in the afterlife. The Pharisees, the more popular middle-class, but spiritual elitists, were better respected by the people. They accepted all the Scriptures but added the oral tradition (allegedly given to Moses, but not written down, which was more authoritative, compiled into the Mishnah), believed that free will was to be used in accord with God's overall sovereignty and involvement in the world. They believed in the spiritual realities of angels and demons, and the afterlife in which God rewarded or punished in accord with people's choices and actions. The disciples forgot to bring bread, so when Jesus warned them about the false teachings of the above groups, they thought He was reproving them for forgetting the bread. Jesus refreshed their memory about the two miraculous feedings to show them that bread wasn't the issue, but teaching was. 16:13-20 Jesus gives them a pop-quiz about His identity. They give Him a non-committal survey answer (as many who aren't sure about God do today), and He zeros in on their personal belief. Peter gets it right, with a little prod from God. He says that the Son of Man, Jesus, is the Messiah (the anointed one as promised in the OT), the Son of the Living God. Peter is “petros,” a masculine noun, used to refer to a stone or pebble. Rock is “petra,” a feminine noun, used to refer to a massive cliff or bedrock, and used by Jesus in the Sermon on the Mount (7:24) as a reference to His words, which the wise man built his house upon. Rock is one of the titles of the Messiah (Hab 1:12), as well as God. Jesus was referring to Himself or Peter's confession of Him as the foundation of the church. The Messiah is the foundation of God's building according to both testaments. Isaiah 28:16 Therefore thus says the Lord GOD: " Behold, I lay in Zion a stone for a foundation, A tried stone, a precious cornerstone, a sure foundation; Whoever believes will not be ashamed. 44:8 Is there a God besides Me? Indeed there is no other Rock; I know not one.' "
1Corinthians 3:11 indicates that Christ is the foundation of the church “3:11 For no other foundation can anyone lay than that which is laid, which is Jesus Christ.” (cf 1Cor 10:4). A lot of the words used here are also in Psalm 89 the Davidic Covenant/Dynasty (LXX 89:4; 5; 21; 38; 48; 51), adding support to the view that Christ was thinking of Himself as the Davidic descendent, not Peter. Christ calls Himself the Rock later, in Matthew 21:42. There is no way that Christ could build His church, against which the gates of Hades (more likely a reference to death than the powers thereof) would not prevail, on one finite human, and a frail one at that. Just four verses later (18:22-23) Peter is opposing God's will, and is called Satan by Jesus indicating he was carrying out Satan's will rather than God's. 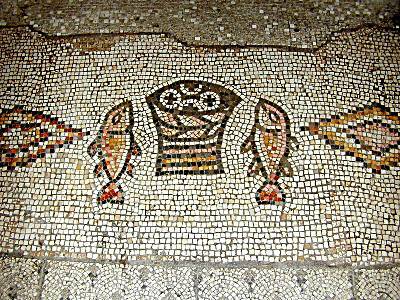 At the end of the Gospel he denies Jesus, and goes back to fishing. On the day of Pentecost, and for the first half of Acts he does better. Although Peter was one of the leaders of the Jerusalem council in Acts 15, it is James who gives the summary decision after much discussion (not a papal decree). Peter's ministry declines and is surpassed by Paul as the book of Acts progresses. Peter is mentioned second of the three pillars or leaders of the church (along with James and John, the three guys who were closest to Jesus) in Galatians 2:9, and two verses later is rebuked by Paul for being clearly wrong about eating with Gentiles. Galatians 2:11 Now when Peter had come to Antioch, I withstood him to his face, because he was to be blamed/condemned. Peter refers to himself as a fellow-elder in writing to church leadership in 1Peter 5:1. 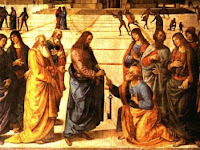 None of the early church councils from AD 300-400 recognized Peter as the foundation of the church; there was no “pope.” All bishops were considered successors of the apostles. It wasn't until AD 600 that Gregory the Great made Peter the first pope (see the Dictates of Gregory). Matthew is the only one to record Jesus' use of the Greek word for church/assembly (ekklesia) here, and in 18:17, which means “called out ones” a distinct group from the Jewish nation (to whom belonged the kingdom, although the assembly/congregation of the righteous was frequently mentioned in the OT). 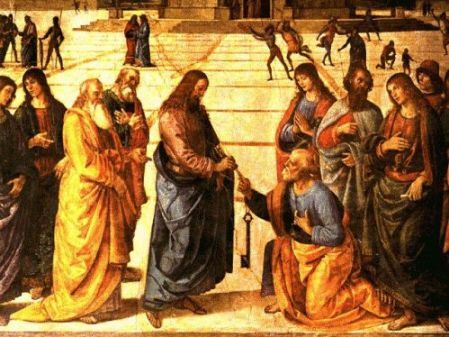 Peter, as a representative of the disciples, is given the keys to the kingdom, (mentioned again in 18:18, along with church). Keys were usually carried by stewards, who carried out the master's will. The binding and loosing are in the future perfect tense (a deliberate use, since the future tenses of both verbs occur), as accurately reflected in the above translation and the NASB. Binding and loosing were rabbinic tasks of saying what was or wasn't in accord with the law. This is not about Peter tending the pearly gates, determining who does or doesn't enter heaven (it's whatever, not whoever, and about the kingdom, not heaven). The subject under consideration is not the called out group (the church), but the kingdom coming from the heavens, which thus far has been announced and rejected, and no longer imminent (and considered to be postponed). The pronouncements about the kingdom made by the apostles, particularly Peter in Acts 2, 3, and 10, which extended salvific blessings of the kingdom to the Gentiles, will be made in accord with what has already been determined in heaven (John 16:13). This understanding of the keys preserves the distinction between the OT kingdom coming from the heavens (which is not heaven), announced by John and Jesus, and the church, which Jesus would build in the future. 16:21-23 Having mentioned that the gates of Hades (death) would not prevent Him from building His church, Jesus starts to instruct the disciples about His upcoming death and resurrection (a concept they found much harder to grasp than the parables about the kingdom in chapter 13). Peter slips over to the dark side, doing the devil's work in looking at things only from a temporal human perspective, rather than God's agenda. Not an auspicious start for the holder of the keys. Jesus would be equally displeased for any disciple to care more about the things of this life, than of the next, as the next section relates. Application: Every day you can exchange the passing minutes for enduring glory, why wouldn't you? What are you holding on to which is worth more than the eternal blessing of God? Prayer: God, help me clearly see my life on this planet as You do, and follow the path my Lord and Savior trod, and experience the glory He promised. Amen. 17:1 After six days, Jesus took with him Peter, James, and John his brother, and brought them up into a high mountain by themselves. 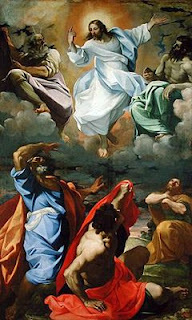 2 He was transfigured before them. His face shone like the sun, and his garments became as white as the light. 3 Behold, Moses and Elijah appeared to them talking with him. 4 Peter answered, and said to Jesus, "Lord, it is good for us to be here. If you want, let’s make three tents here: one for you, one for Moses, and one for Elijah." 5 While he was still speaking, behold, a bright cloud overshadowed them. Behold, a voice came out of the cloud, saying, "This is my beloved Son, in whom I am well pleased. Listen to him." 6 When the disciples heard it, they fell on their faces, and were very afraid. 7 Jesus came and touched them and said, "Get up, and don’t be afraid." 8 Lifting up their eyes, they saw no one, except Jesus alone. 9 As they were coming down from the mountain, Jesus commanded them, saying, "Don’t tell anyone what you saw, until the Son of Man has risen from the dead." 10 His disciples asked him, saying, "Then why do the scribes say that Elijah must come first?" 11 Jesus answered them, "Elijah indeed comes first, and will restore all things, 12 but I tell you that Elijah has come already, and they didn’t recognize him, but did to him whatever they wanted to. Even so the Son of Man will also suffer by them." 13 Then the disciples understood that he spoke to them of John the Baptizer. 14 When they came to the multitude, a man came to him, kneeling down to him, saying, 15 "Lord, have mercy on my son, for he is epileptic, and suffers grievously; for he often falls into the fire, and often into the water. 16 So I brought him to your disciples, and they could not cure him." 17 Jesus answered, "Faithless and perverse generation! How long will I be with you? How long will I bear with you? Bring him here to me." 18 Jesus rebuked him, the demon went out of him, and the boy was cured from that hour. 19 Then the disciples came to Jesus privately, and said, "Why weren’t we able to cast it out?" 20 He said to them, "Because of your unbelief. For most certainly I tell you, if you have faith as a grain of mustard seed, you will tell this mountain, ‘Move from here to there,’ and it will move; and nothing will be impossible for you. 21 But this kind doesn’t go out except by prayer and fasting." 22 While they were staying in Galilee, Jesus said to them, "The Son of Man is about to be delivered up into the hands of men, 23 and they will kill him, and the third day he will be raised up." They were exceedingly sorry. 24 When they had come to Capernaum, those who collected the didrachma coins came to Peter, and said, "Doesn’t your teacher pay the didrachma?" 25 He said, "Yes." When he came into the house, Jesus anticipated him, saying, "What do you think, Simon? From whom do the kings of the earth receive toll or tribute? From their children, or from strangers?" 26 Peter said to him, "From strangers." Jesus said to him, "Therefore the children are exempt. 27 But, lest we cause them to stumble, go to the sea, cast a hook, and take up the first fish that comes up. When you have opened its mouth, you will find a stater coin. Take that, and give it to them for me and you." Observations: 17:1-8 Jesus takes His three closest companions (who would become the main leaders of His church) up a high mountain, and is metamorphosed (change of form) before their eyes. What was objectively true about Him (King of Glory), became a reality in His life. This is the same process believers need to go through according to Romans 12:1-2, in order to experience God's perfect will in their lives (transformed by the renewing of the mind). They see the King in the glory of His kingdom. Light, energy, power, dominion, and glory are all related. Those who fail to grasp that understanding, will remain in the dark about a lot of passages. At the end of the last chapter (see comments there) Jesus promised some would see the Son of Man appear in His kingdom. The Kingdom is present in the person of the King (Luke 17:21). Moses and Elijah, who had both seen God's glory (Ex 34, 1Kg 19:11) were representative of the Law and Prophets and testified to Him (they must have been wearing name tags for the disciples to recognize them). The Father validates Jesus' kingdom claims as well, echoing the comments at Jesus' baptism (3:17) adding the instruction to “hear/obey Him,” which is what one should do regarding a king. Peter's suggestion of three tents might have been a reference to the Feast of Tabernacles, which anticipated the rest of the Millennial kingdom. The Transfiguration also validates the expectation of the kingdom being that promised in the law and the prophets (Isaiah 40-66 and elsewhere), where the Messiah would physically rule in glory in the land of Israel. 17:9-13 Jesus tells the disciples to keep quiet about what they've experienced (Messianic Secret) until the Son of Man rose from the dead. According to Malachi 4, Elijah was supposed to come before the Day of the Lord, and restore all things. Jesus said John the Baptist would have fulfilled that prophecy if the people had responded. So I guess we're still waiting for Elijah (keep that extra place set). 17:14-23 The disciples were unable to cast a demon out of an epileptic boy because of a lack of dependent faith, (which would have been manifested by prayer and fasting). If they had faith like a mustard seed, which was so small that it had to depend on something outside itself for growth and nourishment, they could move mountains. But apparently they were depending on their own resources and strength, earning a rebuke from Jesus. His instruction about His upcoming death, caused sorrow (they got the death part, but are a little slow on the resurrection piece). 17:24-27 This is one of my favorite miracles even though I don't like fishing nor taxes. The didrachma was a temple tax, not mandated in the OT, but paid for the upkeep of the Temple by the “pious” Jews. So when the collectors came, they asked Peter if his Master/Teacher paid it. Jesus first establishes that He is totally exempt, being a Son, and not a subject/stranger. Then in a effort to accommodate Himself to those who considered it a good thing to do (all things to all men) so He doesn't cause them to stumble over this issue and miss the truth, He tells Peter to go fishing. Jesus supernaturally supercharges Peter's efforts. Why not have Peter catch a couple of big ones, sell them, and pay the tax? Jesus uses Peter's basic skill set, but makes it clear that He is the one providing the result, through His power/glory. He provides a coin that takes care of both God's purpose, and Peter's need. The lesson for a disciple is that as we seek to do what's right in the sight of God and man, God will provide all we need, according to His riches in glory in Christ Jesus (Phil 4:13). We just need to trust and obey Him. I would love to have seen the expression on Peter's face as he pulled out the hook and coin. The chapter opened with a mural of Christ's glory on the mountain, and ends with a miniature, as the sun shone off the coin. Application: God provides all we need to do His will, be it motivation from a glimpse of His glory, or the means to do what it takes to win a hearing. Prayer: Lord Jesus, You are the Lord of Glory, the King of Kings, and the Savior concerned with my needs and ministry; thanks that I can trust You for all I need to serve You every day. Amen. God in a nutshell: God meets the needs of those who seek Him in truth. He allows the bad guys to temporarily win, but will make it up to His servants. Build-a-Jesus: Jesus is clearly seen as God incarnate, controlling the physical and spiritual realm. He is the King of Glory, but won't establish His kingdom until He returns. He rebukes those who follow tradition, and those who fail to exercise faith. He will reward His faithful followers. Us in a nutshell: Those who follow tradition rather than truth, or their dreams rather than God's desires, will wind up rejected losers. Those who deny themselves to please God, and dependently trust Him, will experience His glory, both here on earth and in the future (and they might get to that future faster than they expected if God so wills). 22 Immediately Jesus made the disciples get into the boat, and to go ahead of him to the other side, while he sent the multitudes away. 23 After he had sent the multitudes away, he went up into the mountain by himself to pray. When evening had come, he was there alone. 24 But the boat was now in the middle of the sea, distressed by the waves, for the wind was contrary. 25 In the fourth watch of the night, Jesus came to them, walking on the sea. 26 When the disciples saw him walking on the sea, they were troubled, saying, "It’s a ghost!" and they cried out for fear. 27 But immediately Jesus spoke to them, saying "Cheer up! It is I! Don’t be afraid." 28 Peter answered him and said, "Lord, if it is you, command me to come to you on the waters." 29 He said, "Come!" Peter stepped down from the boat, and walked on the waters to come to Jesus. 30 But when he saw that the wind was strong, he was afraid, and beginning to sink, he cried out, saying, "Lord, save me!" 31 Immediately Jesus stretched out his hand, took hold of him, and said to him, "You of little faith, why did you doubt?" 32 When they got up into the boat, the wind ceased. 33 Those who were in the boat came and worshipped him, saying, "You are truly the Son of God!" 15:1 Then Pharisees and scribes came to Jesus from Jerusalem, saying, 2 "Why do your disciples disobey the tradition of the elders? For they don’t wash their hands when they eat bread." 3 He answered them, "Why do you also disobey the commandment of God because of your tradition? 4 For God commanded, ‘Honour your father and your mother,’ and, ‘He who speaks evil of father or mother, let him be put to death.’ 5 But you say, ‘Whoever may tell his father or his mother, "Whatever help you might otherwise have gotten from me is a gift devoted to God," 6 he shall not honour his father or mother.’ You have made the commandment of God void because of your tradition. 7 You hypocrites! Well did Isaiah prophesy of you, saying, 8 ’These people draw near to me with their mouth, and honour me with their lips; but their heart is far from me. 9 And in vain do they worship me, teaching as doctrine rules made by men.’"
10 He summoned the multitude, and said to them, "Hear, and understand. 11 That which enters into the mouth doesn’t defile the man; but that which proceeds out of the mouth, this defiles the man." 12 Then the disciples came, and said to him, "Do you know that the Pharisees were offended, when they heard this saying?" 13 But he answered, "Every plant which my heavenly Father didn’t plant will be uprooted. 14 Leave them alone. They are blind guides of the blind. If the blind guide the blind, both will fall into a pit." 15 Peter answered him, "Explain the parable to us." 16 So Jesus said, "Do you also still not understand? 17 Don’t you understand that whatever goes into the mouth passes into the belly, and then out of the body? 18 But the things which proceed out of the mouth come out of the heart, and they defile the man. 19 For out of the heart come forth evil thoughts, murders, adulteries, sexual sins, thefts, false testimony, and blasphemies. 20 These are the things which defile the man; but to eat with unwashed hands doesn’t defile the man." 21 Jesus went out from there, and withdrew into the region of Tyre and Sidon. 22 Behold, a Canaanite woman came out from those borders, and cried, saying, "Have mercy on me, Lord, you son of David! My daughter is severely demonized!" 23 But he answered her not a word. His disciples came and begged him, saying, "Send her away; for she cries after us." 24 But he answered, "I wasn’t sent to anyone but the lost sheep of the house of Israel." 25 But she came and worshipped him, saying, "Lord, help me." 26 But he answered, "It is not appropriate to take the children’s bread and throw it to the dogs." 27 But she said, "Yes, Lord, but even the dogs eat the crumbs which fall from their masters’ table." 28 Then Jesus answered her, "Woman, great is your faith! Be it done to you even as you desire." And her daughter was healed from that hour. 13 Now when Jesus came into the parts of Caesarea Philippi, he asked his disciples, saying, "Who do men say that I, the Son of Man, am?" 14 They said, "Some say John the Baptizer, some, Elijah, and others, Jeremiah, or one of the prophets." 15 He said to them, "But who do you say that I am?" 16 Simon Peter answered, "You are the Christ, the Son of the living God." 17 Jesus answered him, "Blessed are you, Simon Bar Jonah, for flesh and blood has not revealed this to you, but my Father who is in heaven. 18 I also tell you that you are Peter, and on this rock I will build my assembly, and the gates of Hades will not prevail against it. 19 I will give to you the keys of the Kingdom of Heaven, and whatever you bind on earth will have been bound in heaven; and whatever you release on earth will have been released in heaven." 20 Then he commanded the disciples that they should tell no one that he was Jesus the Christ. 21 From that time, Jesus began to show his disciples that he must go to Jerusalem and suffer many things from the elders, chief priests, and scribes, and be killed, and the third day be raised up. 22 Peter took him aside, and began to rebuke him, saying, "Far be it from you, Lord! This will never be done to you." 23 But he turned, and said to Peter, "Get behind me, Satan! You are a stumbling block to me, for you are not setting your mind on the things of God, but on the things of men." 24 Then Jesus said to his disciples, "If anyone desires to come after me, let him deny himself, and take up his cross, and follow me. 25 For whoever desires to save his life will lose it, and whoever will lose his life for my sake will find it. 26 For what will it profit a man, if he gains the whole world, and forfeits his life? Or what will a man give in exchange for his life? 27 For the Son of Man will come in the glory of his Father with his angels, and then he will render to everyone according to his deeds. 28 Most certainly I tell you, there are some standing here who will in no way taste of death, until they see the Son of Man coming in his Kingdom." 17:1 After six days, Jesus took with him Peter, James, and John his brother, and brought them up into a high mountain by themselves. 2 He was transfigured before them. His face shone like the sun, and his garments became as white as the light. 3 Behold, Moses and Elijah appeared to them talking with him. 4 Peter answered, and said to Jesus, "Lord, it is good for us to be here. If you want, let’s make three tents here: one for you, one for Moses, and one for Elijah." 5 While he was still speaking, behold, a bright cloud overshadowed them. Behold, a voice came out of the cloud, saying, "This is my beloved Son, in whom I am well pleased. Listen to him." 6 When the disciples heard it, they fell on their faces, and were very afraid. 7 Jesus came and touched them and said, "Get up, and don’t be afraid." 8 Lifting up their eyes, they saw no one, except Jesus alone. 9 As they were coming down from the mountain, Jesus commanded them, saying, "Don’t tell anyone what you saw, until the Son of Man has risen from the dead." 10 His disciples asked him, saying, "Then why do the scribes say that Elijah must come first?" 11 Jesus answered them, "Elijah indeed comes first, and will restore all things, 12 but I tell you that Elijah has come already, and they didn’t recognize him, but did to him whatever they wanted to. Even so the Son of Man will also suffer by them." 13 Then the disciples understood that he spoke to them of John the Baptizer.